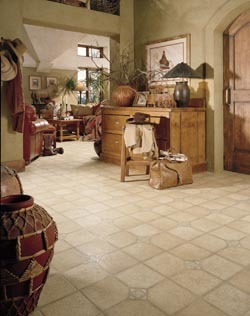 Upgrade the value and appeal of your home with the strength and style of our luxury vinyl tile. When you don’t have an unlimited budget for your next home improvement project, choose from our wide selection of resilient flooring—with collections of stylish and inexpensive luxury vinyl floor tile and luxury plank flooring. With help from our flooring specialists, you can have the flooring that best suits the active lifestyle in your household. Choose from a broad inventory of vinyl flooring in every color and texture imaginable. This flooring is scratch resistant and easy to clean, and that can make a big difference for families with kids and pets. Replace the aging and fading flooring in any room with floors that boost the appeal and value of your home. We can help you integrate the ideal flooring that best suits your needs in looks, performance, and price. Eliminate the guesswork that comes from buying new vinyl and tile flooring with the help of our knowledgeable and friendly sales staff. We are focused on your complete satisfaction, and that means we support you every step of the way—from selection to installation. From the time you choose the right flooring until the first moment you walk across your new floors, we are there to help make your experience as positive and convenient as possible. Our well-stocked flooring store has an exclusive selection of resilient flooring. Choose these floors for their durability and ease of maintenance. Protect the investment you are making in the value and appearance of your home by getting resilient flooring you can trust. You need your flooring to stand up to the pressure that comes from high traffic and daily wear and tear. Our vinyl floors look great in any room, and hold up well in wet areas like your kitchen and bathrooms. They retain their stunning appearance for years to come by resisting stains, scratches, and water damage. In addition to their durable strength, this flooring comes in a broad array of colors and patterns. You are sure to find the right fit for your décor and the rooms you are renovating. Our luxury vinyl floor tile is the perfect combination of style and function. With an extra layer for added protection, this high-performance flooring is attractive and effective in any environment. This reliable product is a cost-effective alternative to traditional types of tile, and you are sure to get a floor that will look as good as new for years to come. With advanced printing techniques, you can have the look of high-end flooring without the cost and maintenance. Choose our versatile luxury vinyl floor tile and you can replicate the look of any kind of flooring you have in mind. Create a look that fills a room with timeless elegance and traditional warmth when you choose our luxury plank flooring. This option replicates classic hardwood floors and includes such features as different wood grains and stains. It is easy to maintain and allows you to expand your design horizon and improve the look of any area in a cost-effective manner. The ease of maintenance means your family will have a cleaner living environment as well. Our local store and showroom offers one of the area’s largest selections of vinyl flooring. The products we carry are designed to perfectly replicate the coveted appearance of high-end materials, such as hardwood, ceramic, and natural stone. Our focus is on helping you find the right look for your home, and we are committed to your complete satisfaction. Get the most from your flooring investment and ensure your new tile fits the room you are renovating with our professional luxury vinyl tile installation. Our team of trained installers will install your floors correctly the first time. Only with our professional installation process can you be sure that your flooring will stand the test of time. Be confident that our installation expertise will result in effective and long-lasting new floors. We stand behind the work we do with our Ultimate Confidence Guarantee, which covers both purchases and installations. If you are not satisfied with the new flooring we provide within the first 30 days, we’ll replace it with a comparable product free of charge. Contact us today for a free estimate on the finest luxury vinyl tile available for your home. Financing options available. We proudly serve the vinyl flooring needs of Lafayette, Carencro, Youngsville, Broussard, and Scott, Louisiana, as well as the surrounding areas.